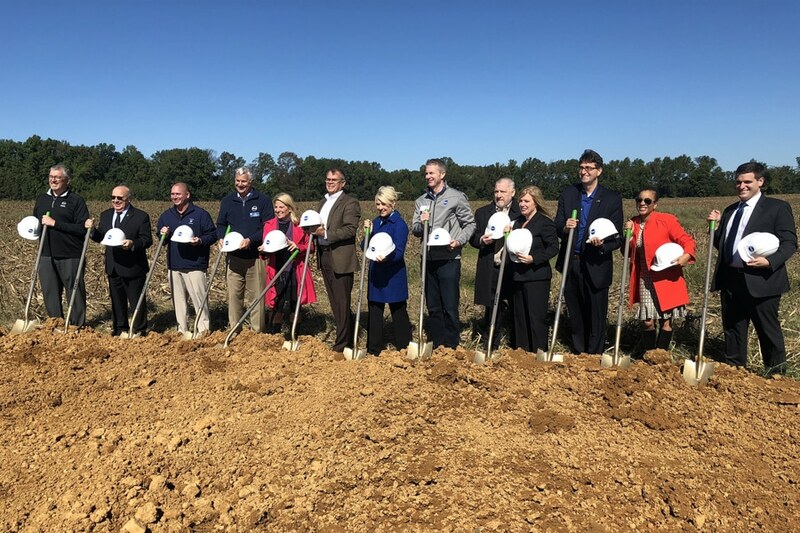 In June 2018, CEO Joe Tracy shared some good news — Dot’s 12th U.S. distribution center (DC) is being built in Bear, Delaware. Months of consideration and careful planning led to choosing Bear as the next site for a new DC. “We are excited about the selection of Delaware for our newest DC. Bear is close to Interstate 95, which gives us great access to major markets on the East Coast,” said Senior Vice President Jim Tracy. Not to be taken for granted, growth precipitated the need for a new DC. Bear has a population of approximately 20,000 and is located 14 miles south of Wilmington. According to legend, the city got its name from a local tavern near the road from Wilmington to Dover, now formed by U.S. 40 and State Route 7, whose sign bore the image of a large bear. The pub was demolished in 1845 to make way for the area’s first railroad. Space has been tight at the Maryland DC for a few years and volume was being shifted to nearby DCs. Leadership considered expanding the Maryland DC, but they encountered too many obstacles, which led to a search for land to build a new facility. We broke ground in Bear in October with a goal of opening in late 2019 or early 2020. In preparation for the opening of the new DC, Dot Transportation, Inc., opened a terminal in New Castle, Delaware. “The goal is to hire 125 employees the first year of operation,” Eastern Region General Manager Brian Duffield said. The new facility won’t be the first time Dot has had a presence in Delaware. “It is ironic we are again returning to the area where we opened a DC in 1987 in New Castle to complete the geographical expansion into the northeastern states,” Jim said. New Castle closed in 1994 when the Hagerstown facility opened. Dot Delaware is hiring truck drivers! If you are looking for a driving career in the Delaware area, check out our website and let us know you’re interested. Our class A CDL jobs are customizable so you’re bound to find a driving schedule that works for you. For more information on all of our DC and terminal locations and truck driving opportunities, visit our Dot locations page.